Consistently one of the most booked restaurants on OpenTable since it opened, Waterbar boasts fresh seafood and a panoramic view of the Bay Bridge. We came here for lunch and unfortunately it was too cold to sit outside. As you walk in, you see a bar to the left stacked with oysters, clams, lobsters, etc. 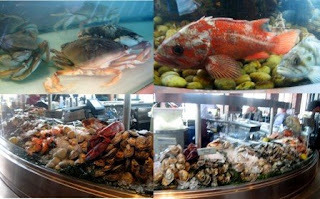 In the center of the dining room, there is an aquarium filled with various kinds of fish, including one giant eel. We were seated in the back room, so we also passed by tanks of live lobsters, crabs, etc. All that display of seafood sure made me hungry! The three of us shared a couple appetizers - the tuna paillard and a fried oyster special. The tuna paillard was very tender and lightly seasoned with a vinaigrette sauce. The fried oyster was lightly battered and rested on a bed of smoked cod (? - couldn't quite tell what type of fish it was...) It was accompanied by a mustard sauce and garnished with sliced olives. The flavors worked well together with each other. As for entree, two of us got the lobster roll and K got the grilled sea scallops. There was a healthy helping of lobster on toasted bread, and the entree was accompanied by celery root remoulade. The lobster was very tender and the best part was that the dish came with melted butter for dipping. However, I would have to say that the lobster club at Asia de Cuba was better (yes, I'm behind on blogging that entry... :-p). Maybe it's a bit of an unfair comparison though since the lobster club had bacon and avocado in it, which is always a great combination. Even though we were pretty full, we of course went ahead and shared two desserts. We got the Brownie Brown Sugar Parfait, which was a heavenly mix of chewy brownie bites with cream and gooey caramel sauce. It was absolutely delicious and we thought it couldn't be topped... until we tasted the Warm Chocolate Pudding Cake with coffee ice cream. The combination was decadent and offered the perfect ending to the meal. All in all, the meal was great, especially the desserts, albeit quite pricey for lunch. It's a nice splurge every once in a while (or if someone else is footing the bill :-) and definitely sit outside for the view. P.S. I want to thank Kat for editing my photos for this post. You did an amazing job! Please check out her awesome blog. WOW Ms. Lin - this place looks fantastic, and yes the photos really help. I'm adding it to my list to try next time I'm in SF!! Who can resist liquefied butter?! The desserts also look amazing - my mouth is watering just looking at the photos. Gotta get me some of that Brownie Brown Sugar Parfait! Ms. Lin - just wanted to remind you that it is already July and you haven't posted anything new. We are all anxiously waiting!